2017 NCAA Indoor Men’s 3K/5K Preview: The Edward Cheserek Show Rolls On; Can He Break the NCAA All-Time Record for Individual Titles (15)? The 2017 indoor track and field season culminates this weekend at the 2017 NCAA Indoor Track & Field Championships in College Station, Texas. We’ll be on-site in the Lone Star State starting Thursday, but before we get down there we’ve previewed the mid-d/distance events so that you can know what to watch for at the meet. Below you’ll find our look at the men’s 3k and 5k, where Edward Cheserek will look to pull off a sweep for the third time in four years. Even with a mile prelim in his legs, Oregon’s Edward Cheserek is close to a lock in this race. Because while he’s the NCAA record holder in the mile (3:52.01), his blend of endurance and speed is even better suited to the 5,000 meters. Cheserek’s personal best of 13:18 dwarfs the field, and even that is selling him short considering it’s almost three years old. Cheserek is more realistically a 13:0x guy, and when you put a 13:0x guy against a bunch of 13:3x and 13:4x guys, there’s usually only one outcome. One mile race two and a half hours earlier — in which Cheserek merely needs to qualify, not win — is not going to bridge that gap. 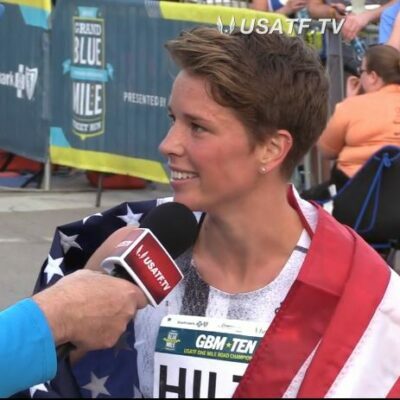 Now you might say, wait a minute; didn’t Washington’s Colby Gilbert beat Cheserek in a 5,000 last year? And isn’t Gilbert’s SB of 13:34 just two seconds slower than Cheserek’s? And you’d be right. But we now know that Cheserek was dealing with a calf issue when Gilbert beat him last spring. When the two met two months later at NCAAs, it was no contest: Cheserek finished first in 13:25, almost 30 seconds ahead of Gilbert in 13th. Cheserek and Gilbert have also already raced a 5k this year, at the Husky Classic on February 10, and it played out how you might expect: Gilbert hung tough but Cheserek totally dusted him on the final lap. We see no reason why Friday’s 5,000 in College Station will be any different. The only other guy under 13:40 is Tulsa’s Marc Scott, and the Brit has put together quite a season after not racing cross country in the fall (he was out of eligibility). He ran a quick 13:38 back on December 9 to knock out his qualifier and hasn’t lost a race since, most notably outkicking Syracuse’s Justyn Knight — who beat Cheserek in XC — to win the 3k at Iowa State on February 10 in 7:47. That’s an exceptional performance, but Cheserek is simply on another level. By our count, Cheserek and Scott have faced each other seven times in races in which both parties were trying to win (we’re throwing out the 2015 Stanford Invite where Cheserek was simply knocking out an NCAA qualifier). Scott’s record in those races is 0-7, with the smallest margin of defeat at 17 seconds. Scott is a fantastic runner. 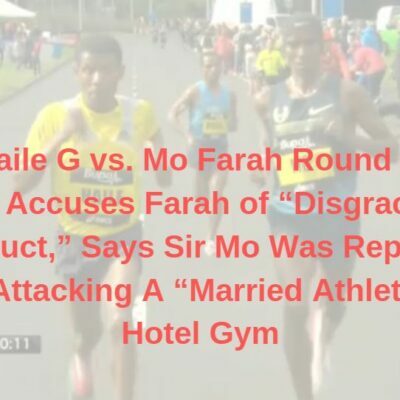 He’s not beating Edward Cheserek. LRC prediction: Cheserek wins NCAA individual title #14.
Who will win the men's 5k at 2017 NCAA Indoors? If Cheserek is going to lose an individual event, it’s this one. The men’s 3,000 is the final individual running event of the meet, and if Cheserek does the DMR (and we think he will), the 3k will be his fifth race in 25 hours. Cheserek has tripled at the last two NCAA Indoor meets and performed incredibly both times, but this is different: in 2015, he doubled in the mile/3k on Saturday but didn’t have to run the 5k on Friday; in 2016, he doubled in the 5k and DMR on Friday but didn’t have to run the mile on Saturday. Even Cheserek has a limit at which point his performance will begin to suffer. The question is whether five races in 25 hours is enough to reach that limit. This field is also the strongest he’ll face in an individual event. Gilbert has been on fire in 2017. So has Scott, and Knight beat Cheserek the last time they raced at NCAA XC. We think Knight has the best chance at an upset as he’s running this event fresh — unlike Gilbert, Scott and (especially) Cheserek. But Knight also lost to Scott earlier this year. Even if you give Knight a pass on that, however (and to be fair to Knight, he had totally dropped the field in that race and only realized Scott was coming on like a freight train at the last second), does he have what it takes to defeat Cheserek on the track? When he raced Cheserek in a similar situation in the 3k last year at NCAAs (Knight fresh, Cheserek running his third race of the weekend), Cheserek had no problem dropping him with three laps to go. On the other hand, if we use the XC season as a gauge, Knight is better now than he was last year. If Cheserek has to go to the well in the mile final (which is two hours before the 3k final), Knight has a chance. The problem for Knight, as we pointed out in our mile preview, is that Cheserek isn’t likely to be pushed in the mile. This should also go without saying, but Knight has to bring his A game if he is to win. He was great at NCAAs in cross country last year, but he didn’t run well in the NCAA 5,000 outdoors, where he was only 10th (and that’s not because he wasn’t fit; he ran 13:26 and outkicked Galen Rupp two weeks later). There’s also a small chance that Cheserek doesn’t start this race. 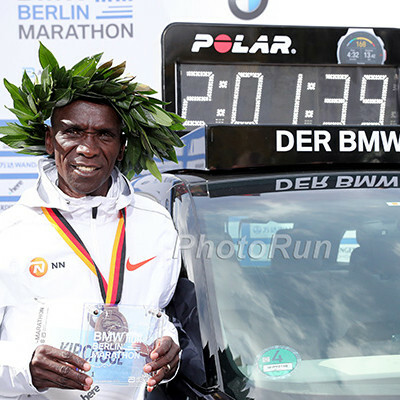 Recall that in 2014, the last time someone attempted the mile-3k-5k triple, Lawi Lalang was a DNS in the 3k after failing to win the 5k and mile. By tripling Cheserek, Oregon is clearly going all-in for the team title. But if it’s clear by the time the 3k starts that they don’t have a shot at the team title, they may bag it and scratch Cheserek from the race. That is unlikely to happen, however. Florida is the favorite on the men’s side, and two of the events in which the Gators are expected to score big points (the triple jump and 4×400) likely won’t conclude until during or after the 3k. Plus Cheserek may want to run it to grow in legendary status and increase the amount of money Nike feels like it owes him for not going pro early. 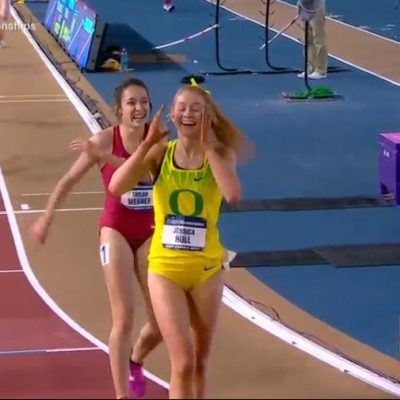 If Oregon wins, the Ducks will join Arkansas as the only schools to win four straight NCAA indoor titles — a feat last accomplished by the Razorbacks from 1997 to 2000. Oregon still has a long way to go to match the longest streak ever, though: Arkansas won 12 straight from 1984 to 1995. Cheserek also has a chance to make more history. If he succeeds in winning the mile, 3k and 5k at NCAAs, he won’t just be the first man to sweep the distance events: he’ll be the first athlete, man or woman, to win three individual events at the same NCAA indoor championship. 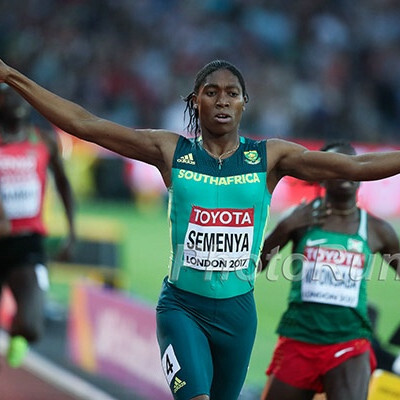 He’d also become the first athlete, man or woman, to win eight individual indoor titles. Plus he should easily surpass Suleiman Nyambui‘s career scoring record at the NCAA indoor meet. Right now, Nyambui has 78 career points to Cheserek’s 63 (the USTFCCCA counts relay titles as 2.5 points). So Cheserek need only win two individual events to move past Nyambui on that list. Finally, sweeping all three individual events would bring him to 16 individual NCAA titles (counting cross country). That, too, would be a record, one more than Nyambui’s 15 at UTEP from 1979 to 1982. 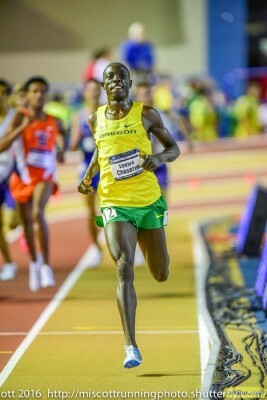 LRC prediction: There’s no way of knowing exactly how tired Cheserek will be when the 3,000 final goes off; we’ve never seen him tackle this sort of workload at NCAAs before. But based on the last three years, Cheserek doesn’t lose at NCAAs because he’s tired. 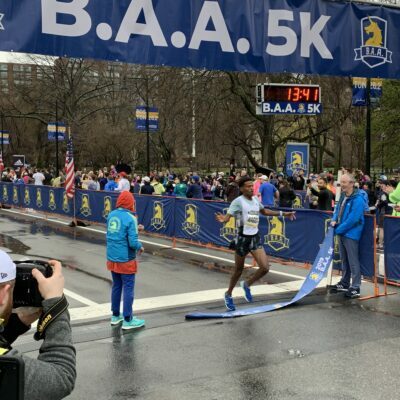 He loses because another stud runs even better than he does: think Lawi Lalang in the outdoor 5k in 2014 or Patrick Tiernan last fall. Knight has beaten Cheserek at NCAAs in the past, and if he is to do it again, it’s because he summons another epic performance like his one in Terre Haute in November. 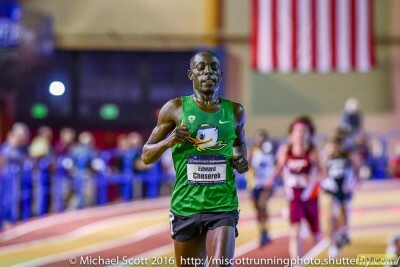 We say Cheserek FTW. If he’s too tired from the mile-5k-DMR, we’re picking Knight, though Gilbert and Scott both have a shot, especially if one of the latter two races Cheserek close in the 5k. Who will win the men's 3k at 2017 NCAA Indoors?